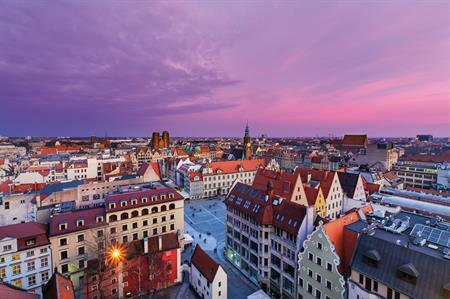 C&IT's Destination of the Month is Wroclaw in Poland, this year's European Capital for Culture. Poland’s stock is rising as a cost-effective alternative to its more dominant European neighbours. While Warsaw and Krakow have historically been the go-to places, Wroclaw, this year’s European Capital of Culture, has emerged as one of the hip new cities to visit on the Continent. New hotels are boosting the existing mix of five-star addresses and chic boutiques, while nightlife and cultural highlights are being driven by the city’s young population. And, how many cities have a UNESCO-protected congress centre? One of Wroclaw’s newest properties is the DoubleTree by Hilton Wroclaw. Groups staying in the 189-room hotel will be within easy reach of the Museum of Architecture and the focal point of the city, the Old Town Market Square. It is also within a quick ride of the 10,000-capacity Wroclaw Congress Centre, which sits in front of the Multimedia Fountain, regarded as one of the most spectacular of its kind in Europe. The five-star Sofitel Wroclaw Old Town is a hit for visiting groups with 205 rooms and suites, a fine-dining restaurant, spa and 11 meeting rooms. One of the best places in the city for traditional Polish fare is Pod Gryfami. Hidden in one of the alleys running off the Market Square, the restaurant is spread across three floors, including a 15th-century wine cellar stacked with plenty of top-notch bottles. Sample a few glasses with a plate of pork cooked in plums and apricots with some chilli potato pancakes on the side. Embark on the Old Town Walk and explore the ‘City of 100 Bridges’ and its medieval character. Both sides of the Odra River that runs through Wroclaw have an incredible story to tell.